Well, I finally have it in my garage, cozy next to the p5. I think it has been almost a full year since I started looking at them. Though the wait paid off, as I got a killer deal on a low-mileage clean car. So it's a 1995 black (i believe) base model. When I started looking, I really didn't care for the hardtops, but in time, I grew to like them. Though I doubt I'll run it much in the nicer months. There are a few issues that I need to fix first. The top is completely trashed. It needs brakes. Not sure exactly what my plans are, suspension is probably near the top of my list. Also some better tires and wheels. I'm going to try to keep from doing much cosmetic stuff, doesn't help performance. What still amazes me is how fun a stockish miata can be. Don't have any shots of my own, went to get some and just ended up driving till it was dark. So last night I swapped the panasonic with no faceplate for a mazda radio from a 626. It was about ten screws and easy peasy. The speakers in the car are junk, it sounds like the passenger side is blown as well. So I am looking for recommendations on brake pads and rotors. Also for a soft top. 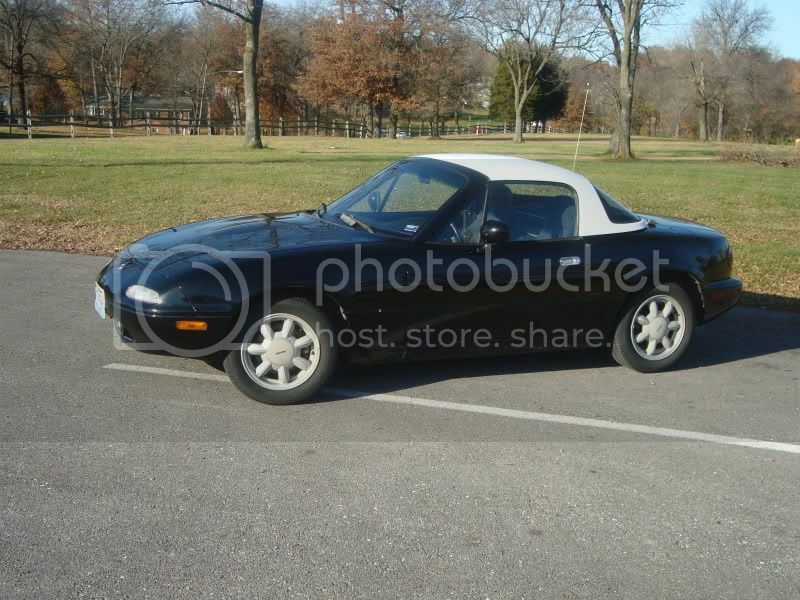 I think at some point I may want a roll bar, may as well be sure any tops I consider will fit over it. I should get some more pics later today as well. I still grin like a goofball too! lol And I"m on blown struts! as to brakes, i'll be waiting for an answer too as i'm 99% sure one of the rotors are mine are warped, as it pulses. Either way, GET PICS! and congrats!! I'm on my 3rd Miada, and after 8+ years, still grinning. So nice score on the car. As far as pads, there is an opinion for every driver out there. I just put a set of Hawk HP pads last week. They are light duty track pads, but what i really like about them is how good they bite when cold. I've also ran Green Stuff pads, and they were good too. As to the rotors, get stock replacements for a street car. if you want to step it up, you can get some slotted rotors. I had a set of Powerslots and they saw a lot of track time with no issues. For the soft top, get a plastic window since it's most compatible with all the roll bars out there. The frame itself is not an issue. I got my PRB Ults (same thing as Axxis Ultamates) at getcoolparts.com for $60ish shipped. I've had them for about 4 months, along with my new rotors (slotted/drilled rotors from DRTracing on ebay). Great stopping power, no noise, but hella dusty. Great stopping power, no noise, but hella dusty. Then I can have dark wheels, no painting!